Have you heard of Jubilee? You may think that it’s this nonsense with the queen, but in fact “Jubilee” is what it is called when you are celebrating a birthday that has a zero at the end of it and so you celebrate it for the whole year. JUBILEE!! My ever-lovin’-Mama thought that up, just in time for her 60th birthday, and sweet jesus if I don’t think it’s just about the best thing I’ve ever heard (perhaps since next year will be a Jubilee for yours truly?). Mama and I embark for points west together today, to bask in our nation’s magesty at Yellowstone and Grand Teton, hiking from bed and breakfast to bed and breakfast (like only Jubilee celebrating ever-lovin’-Mamas do). I’m signing off for the next week in the name of jubilee, but of course you can follow our adventures over on Instagram (@featherbyfeather). 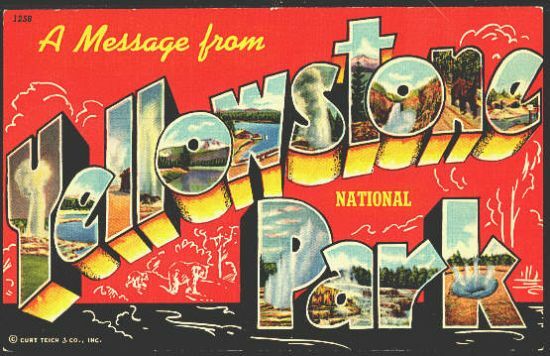 awesome old Yellowstone image from here.